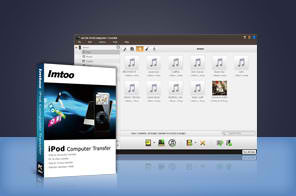 Sharing music and other files between two iPods or between an iPod and a computer or an iPhone or iTouch is made easier with the use of iPod transfer software. Once installed, the ten tools that we present here allow for instant transfer in just a few clicks. You can choose the software with the features that suite your preferences best. TuneAid is the simplest, most straightforward iPod transfer tool out there. It is designed to transfer music files from your iPod to other devices including other iPods, iPhone, iPod Touch, as well as Mac and PC. It easy, convenient, and speedy and worth a try. This transfer software for iPod is compatible with both Mac and Windows. Transferring playlists is easy and very convenient. You are spared the time-consuming task of transferring files one by one. 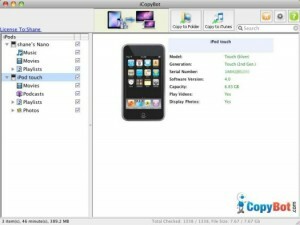 CopyToy can transfer music and video files with no trouble at all. Some users have reported bugs in this program, but it is worth trying out especially if you want to transfer voice memos, iBooks and podcasts after you’re done transferring audio and video files. They say that with more complex tasks it is not as effective as other tools. But for simple tasks it works well enough. You really don’t need a reason for transferring music files from one device to another especially if the tool that you will use won’t cause you anything but a few minutes’ download time. But even if you have to pay something like $20 for a tool that is also equipped with one-click recovery function, then it is well worth it. So, if you need to populate your laptop with songs from your iPod because they all got deleted, all you need is iRip. You won’t even burn 50 calories for that one click that you need to start the transfer. This software works very fast. Its main limitation is that it is not designed for transferring files to and from the iPad. Otherwise, it works very well in transferring all types of files that can be housed by your iPod to any Apple device. This program was created by Xilisoft. This software promises ease of use and automatic transfer. The information stored in your iPod is safe and remains intact during and after the process. What types of files does this Aiseesoft program transfer? 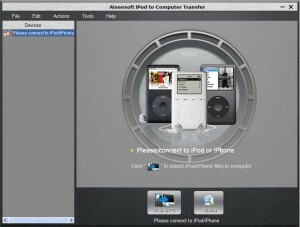 Aiseesoft iPod to Computer Transfer is capable of transferring music files, ringtones, as well as image and video files. This software works with all existing versions of the iPod (classic, mini, nano, shuffle, touch) as well as the iPad and iPhone. You can even use the same software to transfer files from Mac devices to Windows devices. If you need to transfer more than music and video files, TouchCopy is the software for you. It has the capability to transfer messages, ringtones, voicemail, and even your whole address book. This tool is compatible with both Mac and Windows. Users say that there are problems with the interface and the transfer speed, but the pros overcome the cons. This tool is also capable of transferring files of your favorite television series as well as audio book files. 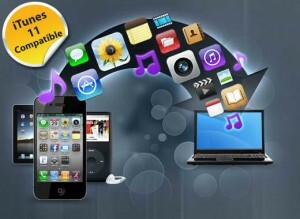 These features make TouchCopy one of the most versatile transfer software for iPod available today. CopyTrans by WindSolutions is a very highly recommended transfer software for the iPod. It is best designed for iPod to PC transfer and lauded by its users for its admirable interface. If you require metadata to be copied without loss in detail, then this is the ideal tool for you. You have to pay for the benefits, though. 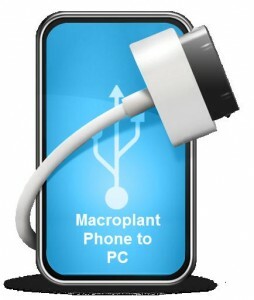 Macroplant Phone to PC used to be called Pod to PC. Now it has been updated. With this innovative tool you can transfer all types of files from your iPod to any computer. There is no need to jailbreak your iPhone before you can use this software, but you still need to attach a USB cable. Here are the very attractive features: metadata recovery, automatic transfer, search, crash recovery, drag and drop support and calendar function. But that’s just for starters. There are so many more features to explore. If one day you decide you want to copy the contents of your iPod into iTunes (songs, movies, videos, apps, messages, contacts etcetera) and you want it done fast and without fear of losing any of your precious iPod contents, all you need is the “ImToo iPod computer transfer” software. It works with all versions of iPod, iPhone and iTunes. And if you are wondering, yes it supports iTunes 10.7, iPhone 5, iPod Touch 5, iPod Nano 7, and iOS 6.